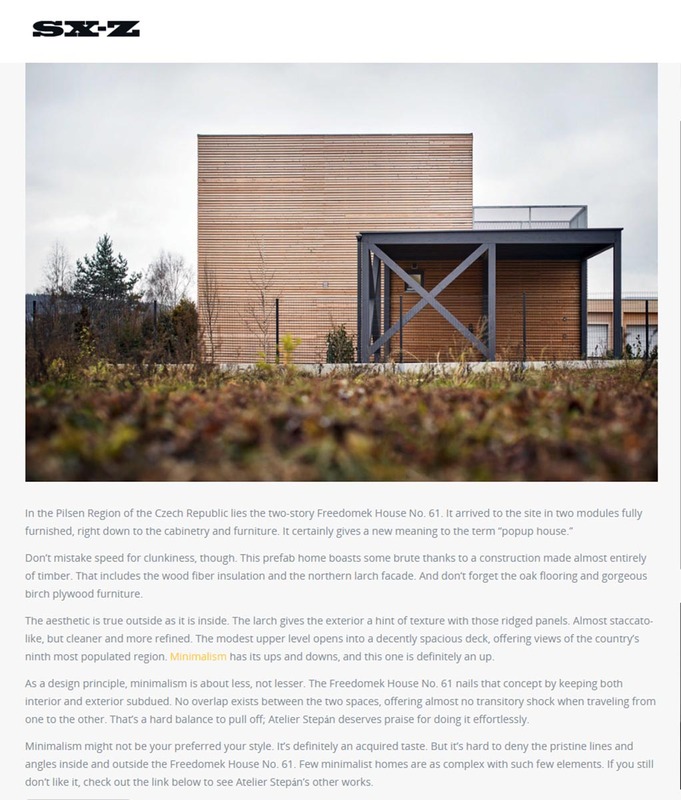 The “Sixty-one”, a home with the number Freedomky No.061, was assembled (to the surprise of neighbours) during one autumn Friday from 7 am to 3 pm, followed by the construction of the carport and terrace. It uses its compositional dimensions and sizes from the author’s previous modules and places them above each other, smaller S (4 x 7m) on top of larger M (4 x 11,5m). Modules were brought to the site fully furnished and equipped, including furniture. The Tachov “Sixty-one” stretches toward the sky and its proportions evoke a similarity with a stylized steamboat, also with the upper terrace – the deck at the fore. From becoming a real houseboat, it is only short of water it could anchor in. 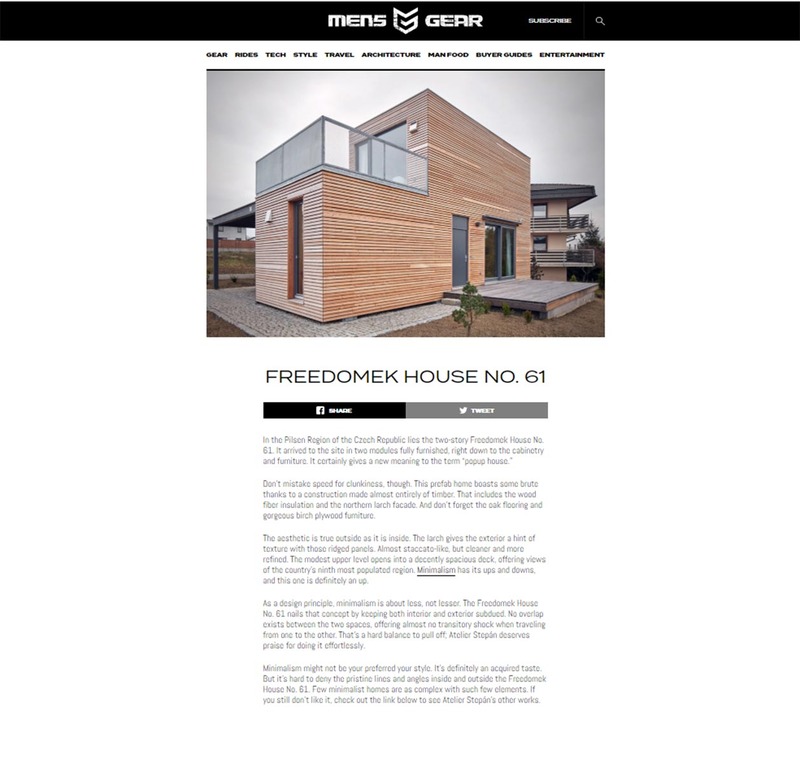 It is the very first 2-story Freedomek in the Czech Republic and has its own specially signed label from the author. The “Sixty-one” conceptually continues along the lines of the inter-war theories of Karel Teige about minimal apartments. Now, several years after presenting No. 001 on Wenceslas square, I find inspiration in the 2-story Baťa half and quarter-houses in Zlín. I was inspired while spending a night in a half-house in Zlín. The “Sixty-one” comes close to Baťa houses in its scale and organization of the interior spaces. The approach to facade division and proportions of window openings may remind one of Corbusier’s houses in the residential area in Pessac. However, the current trend is moving in the direction of mobile and economic housing: it is noticeable in the famous project of the “nomad” apartment cell Loftcube by the German designer Werner Aisslinger. 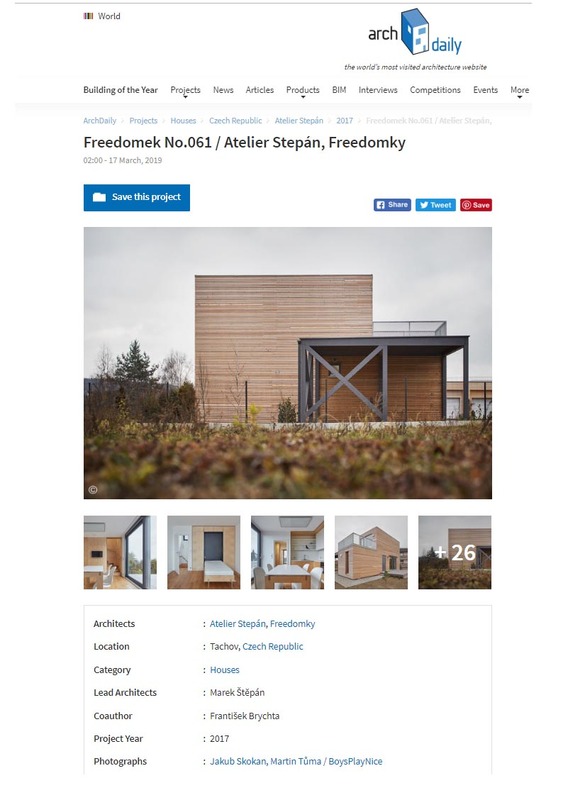 The projects Loftcube and Freedomky are connected by the dream of freedom and by ecological aspects. However, in the base concept they are different. 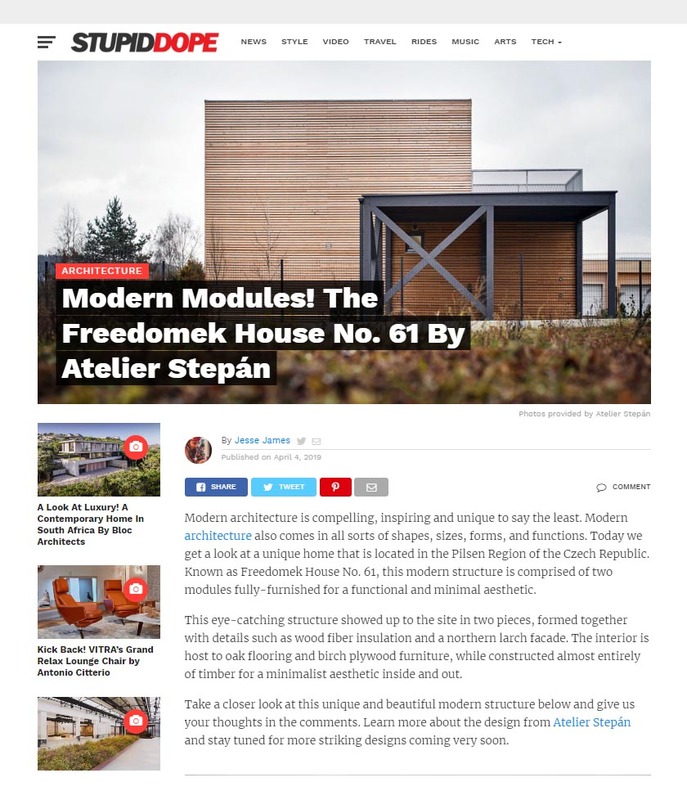 Freedomky are closer to the Central-European region and German speaking countries with its organization of the interior space, and with their material usage of wood and signature design they are true to Ateliér Štěpán. Loftcube has a territorially wider and clientele-wise smaller range. The “Sixty-one” is 95% wooden. Its bearing structure is from glued wood and has exact joints made according to a Swiss patent. Exact milling of the joint into the shape of a trapezoid are made very simply and their strength is immense. The insulation consists of wood fibre insulation panels that have a beneficial faze shift of day – night. The facade is diffusionally open, made of northern larch. The house is heated by radiant panels, ventilated through local recuperation, and windows are wooden with a triple glass panel. The house sits on five ground foundation strips. The interior is white and wooden and reflects the main construction materials of the house. Furniture is made of birch plywood with hidden hardware, the flooring and staircase from solid oak. The “Sixty-one” Freedomek works with the author’s principles of “peasant ecology”, therefore a rational ecology created with a “peasant’s sense and wisdom” and not by the pressure of technology. In this approach the winners are simple and thought-out solutions over complicated technological complexes. It does not use pseudo-ecological components that are ineffective and non-economical in this area and would only follow popular trends. The verification of these principles are the yearly energy expenses of this Tachov Freedomek at the pleasant amount of 840 euros.